On Michael Morpurgo’s website he has a few different ways to look at subgroups of his books, including categories such as Animal Stories and War Stories. In Morpurgo’s catalogue, however, there’s a lot of overlap in these two categories, and it does seem to work, both to make the different wars more accessible to the child reader (who hopefully hasn’t been through such experiences themself) and to show how wars do affect entire communities, not just soldiers. The slightly ironic thing about this book is that it’s about an animal bred to fight, who because of war (in this case the Spanish Civil War) ends up with a very different fate. The narrator is the little boy of the family who bred these bulls for the bullring, who makes a pet of this one bull, who he names Paco, and cannot bear to see killed. I feel I know far less than I should about this particular war and the history around it. More good non-fiction to look into! Speaking of which, while my booklists don’t always show it, I am reading a fair bit of non-fiction. Unlike the novels, however, which I tend to devour quite quickly, I generally have several works of non-fiction on the go at any one time, and read them by chapter, page, or even paragraph at a time, meaning they take far longer to come through as finished, and sometimes never do, if I get too distracted. Something to be working on, I think. 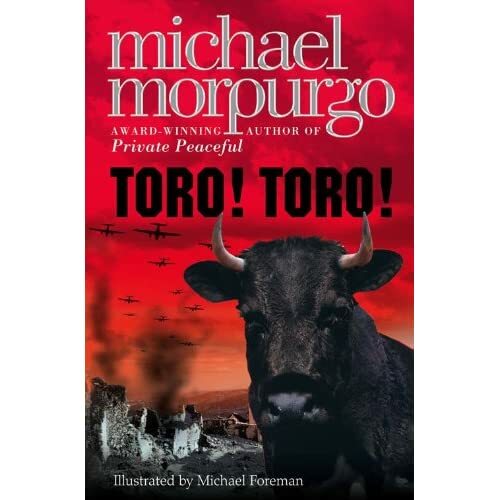 Tags:books, children's books, Children's Fiction, Children's literature, historical fiction, history, Michael Morpurgo, Novels, postaday2011, Spanish Civil War, Toro! Toro! For some reason (well, the Africa and animals connection is one obvious one, but there’s more) I tend to think of these two of Michael Morpurgo’s books together, so here they are, back-to-back. Like Bertie and Millie, Olly and her older brother Matt lose a parent early (in their case their father). Differently, however, they have a large extended family around to support their mother (or at least give her advice). They also don’t grow up surrounded by the vast acres of Bertie’s African ranch or Millie’s English country estate. They do, however, make good use of the (sub)urban garden they have, with Matt building a hide in the garden to watch the nesting swallows. I like this short book a lot, particularly in the way it can use a swallow as a point-of-view character without anthropomorphising the swallow. Hero has feelings like fear and determination that make perfect sense in context. I suppose it just shows how well-written the book is that my main frustration is with character response to a particular situation – having grown up in Ireland, if a close relative of mine had gone off in the night and the first news was a postcard saying he was working in an orphanage in Rwanda run by Irish nuns and headed by one Sister Christina, but without giving an address to be able to contact him by, my reaction would be to phone the nearest Catholic priest or convent, on the assumption they would be able to find out at very least the address of the orphanage, given those details. Olly and Matt’s mother doesn’t do that. Knowing her son, she lets him take the path he’s chosen, and waits for him to get in touch again. N.B. I have previously discussed both books (as well as Cool! from a few days ago). I need to get to longer posts, but for now here’s another on a single children’s book. I don’t mean at all to detract from the readability and interest/attractiveness of this story by suggesting it seems perfectly tailored as a book to read in school – it’s short but has some fully developed storylines, interesting, uses a couple of different and unusual points of view, and has themes that would stereotypically appeal to boys (football, dogs) without ignoring or excluding the girls in the class. It also brings up several issues of greater and lesser difficulty for discussion and development (road safety, family dynamics, parental relationship difficulties, life support, medical ethics, celebrity and personal heroes, and more). I like books that provide lots to talk about!